How do you combat psychic attack? Do you ever suffer from headaches, migraines or constant streaming thoughts that you can't switch off? Well instead of reaching for the aspirin bottle or that strong cup of black coffee, have you considered you might be suffering a “psychic attack"? So what is a psychic attack and how might we deal with it? I realise that some are none too comfortable with the idea that there is a sophisticated consciousness in the surroundinng field able to drain our energy so if you're not open to that possibility, I suggest you stop reading now. Before I do however, I'd like to issue a warning - I believe it is very important for us to understand and deal with the affects of opposing consciousness but it is also vitally important that we don't bring too much energy to the phenomenon and descend into mind games, fear and worry. To do so is self defeating because our fear may invite in the very energies we are seeking to counter. So what exactly is a “psychic attack" and how does it work? Personally I've had countless experiences and so I thought I'd share with you a very recent one including how I dealt with it. A few days ago I awoke in the middle of the night quite restless. I'd been awoken by a dream, my head was thumping and I found it impossible to get back to sleep. I began having constant streaming thoughts about all kinds of things going on in my life right now. Fortunately I was able just to watch the thoughts and not become identified with the process - this then is the most important first step. Not to lose oneself in a continual battle of trying to stop, counter or resolve the thinking but simply letting it flow. In so doing my consciousness was not completely swallowed up in the thinking, such that I was also able to scan my body for particular feelings. Through experience, I knew exactly what to look for; maybe a tightness in the solar plexus - a sure sign of energetic attack; or perhaps a tightness or buzzing in the temples or third eye. Both of these symptoms were present so it was becoming increasingly clear that an attack was in full flow. For an attack to really have an affect like this however, there normally needs to be a channel of entry into ones field - a route by which Opposing Consciousness finds its way in. It could come from a judgment we're holding about ourselves, others or from for example an energetic connection with someone else. So I continued to scan my body and at this point asked my higher guiding consciousness for some help. Sure enough within seconds of asking, I began to feel a slight tightness in my right chest. So I contemplated what this might be. It didn't take long for an answer to arise - my dear mother is currently undergoing treatment for breast cancer. Unsurprisingly she is currently in a good deal of fear and worry and therefore likely herself to be under some form of attack. Although I continually cleanse my field ensuring that little or no cords of energy are attached to me, it quickly became clear that there was an energetic bridge existing between me and my mum. "There's nothing unnatural about this at all" many energy workers might profess, but it does not serve anyone to maintain energetic ties with another no matter how close they may be. We are each whole and integral beings and ideally (in enlightenment) we relate in that way. We don't hold interdependent relationships because they hold our consciousness back. That's not to say we don't hold profound unconditional love for another - of course we do. However, contemplate what the word "unconditional" really means. It means that I won't hold a fixed idea or judgment about you - in other words I love you so much, I allow space for your consciousness to be whatever it chooses to be without limiting it with my idea (or energy) about it. To truly love someone is to set them free in this way. So returning to my experience, I now knew I was being attacked by Opposing Consciousness and the route into my field was through an old energetic bridge between myself and my mother. I knew this would not be just a basic and simple counter. So I got out of bed and went to my meditation room, lit incense and candles, deepened the connecting with benevolence. Next I intensified the energy grid I've created by walking the perimeter of the room and bringing loving attention to the four corners. Following that, I took up a meditative position in the centre of the room and opened a heart connection to Archangel Michael. The bridge established, I could begin to feel that loving consciousness begin to pour in. The next step was to cut the energetic tie between myself and my mum. Some might use visualisations to achieve this, using a sword or scissors to "cut" the energetic web. If such visualisations help build energetic intention from the depths within, then this can be a good thing. Whilst I do appreciate it may help people get in the "zone" so to speak, personally I've found it unnecessary - simple heart felt action suffices. Having dealt with the bridge, it was then important to recognise that my mother's consciousness might suffer from the removal of the bridge so it was important to attune internal empathy for her to soften the breaking of the bridge. Now that protection was in place and the bridge severed, I still had to deal with the Opposing Consciousness which was still present in my field - in the background I was feeling a degree of nausea and my mind was still very active. At least now I knew that when I ejected the consciousness, there would be no open channel through which it could return. So now to deal with the consciousness itself. There are a number of ways of doing this but at least initially, I've found the most effective is to “switch off" the energy source which the consciousness is feeding off. I've found the old Shaolin technique of “becoming as nothing" the best approach for this, because then they have nowhere to strike us. In multi dimensional terms, when we expand our consciousness (by doing spiritual evolutionary work - like meditating) we begin to “light up" through multiple dimensions and therefore attract in Opposing Consciousness. Until we are adept at living through multiple dimensions and know how to move our energies through them, it is good practice to know how to turn one's energy off in those other dimensions and the way to do that is to become well grounded in the third dimension. This harmonises well with “becoming nothing" and in fact they are much the same thing. The technique for doing this is to scan the body identifying areas of tightness - in my case there was still the lingering feeling in my chest. So I moved my awareness to that place and centred in it. Being very clear that there was no efforting to remove it, I simply dissolved into it by becoming awesomely okay with it - not needing it to be a certain way and not judging it as pain, simply accepting it the way it was. Within moments it had completely disappeared. I did this throughout my body - let's be clear though, not all pain is removed that easily. However, what you can do with practice is to instantly let go of the need for the pain to go away - we simply remove negative association connected to pain. Within about 30 minutes of working through my body this way, the feeling of nausea had gone, my mind was quietening and a deep sense of peace and relaxation was descending over my body. I could feel waves of unconditional love washing through me and shortly afterwards drifted off into a blissful slumber. In conclusion, its important to state that even though the process I've described might seem quite lengthy and involved, the more we practice, the faster, slicker and more effective the approach becomes until we find it is a natural part of our beingness and effective psychic attack becomes the rarity rather than the norm. What experiences or questions do you have? I'd be interested to hear. Thanks for your question. Yes of course in "spiritual" circles there's lots of discussion around angels, ascended masters, guides and the like. Some people seem to get really invested in the whole idea - do they exist? if so, how so? The answer to any question (at all) rests in going right back to the source of all things. There is only one moment. Both space and time are illusions. The universe itself arises out of nothing and therefore IS nothing. A dynamic equilibrium exists between nothing (which is everything) and all that we experience. So separation (any separation) is an illusion and therefore all experience is an illusion. Yet to truly know anything - in other words to know ourself - we have to have experience. In order to have experience we have to allow the separation to happen and therefore we have to allow multiplicity of form. Every experience has but one purpose. To know ourselves as what we are, which is infinite potential. So here is the divine paradox....how can you know infinite potential? Well of course in truth you can't! However you can get extremely close to infinite potential - its being extremely close to absolute stillness in all things. "To be and not to be....that is the answer!" So what does this mean in relation to archangels? Well since ALL experience is a distortion then archangels are distortions of truth also. The way to consider this is that we are each being the seer and we project aspects of ourselves outwards to see what we are being. In other words we create mirrors of an aspect of beingness we now choose to experience. So in my experience with Archangel Michael, my higher self was choosing to experience something symbolised by an angel with a sword. However I'm under no illusion that this projection is merely a part of me. It does still serve a purpose - a very valuable one. It adds colour joy and fun to life. It provides a beautiful multi dimensional, multi faceted experience to this existence. It helps build up waves of joy and love from the depths of our being. "How can I safely protect myself while at the same time be there in the convo with some1. I'm mentally surrounding myself with protection, drawing my auric field in, handing their issues back to them with love, but I'm still feeling stressed and drained. Limiting contact is not an alternative." This is a difficult one! Its all about identity. Who are you and what are you being when you're working? What do I mean by this? Bare with me here. Protection is a double edged sword. If there is something in us that fears attack, then we build an identity around that fear. Holding that identity is tiring because in authenticity there is no identity - simply non-identified awareness. When you can be "nothing in it" then there is no effort in setting up a psychic defence. To be "nothing in it" is to understand, confront and release your fear of attack. Probably the best way of doing this is not to resist attack at all! As we are being attacked in some way, we need to feel ourselves being awesomely okay in it watching where tension arises and releasing that; watching our fears and understanding exactly what it is that we fear. If we allow ourselves to go deeply into them without needing the cause of the fear to be removed, then we will have dissolved identity in that kind of attack and it can no longer harm you and neither is it tiring - it just is. So the question then arises "why do we need psychic defence at all if we can be "nothing in it"? The answer is this: in order to act and work authentically, you have to hold consciousness in a particular space and time. In your case, you need to be able to feel the energy of the person you're working with. When we are really skilled at this, we find we become as one with the person we are working with. We actually blend with their energy tasting the fullness of it, darkness, distortions and all. However since our own buttons are no longer being pushed, we don't loose ourselves in the interaction by identifying with the energy. There is always just a "wafer thin slice" of us there in the background which is untouched. I know it sounds a little complex but it comes with practice - by being nothing in it. Then when we can be nothing, this is the time to really put up psychic defence to keep out opposing consciousness. I know it sounds strange but the key to great strength in these matters is first to be able to surrender completely! "2. How do I cut off a telepathic connection with some1. This is for their benefit as well as my own, so while I've cut my side, they haven't done the same and are still very aware of my emotions from a distance. Is there more I can do from my side? Or am I unconsciously being a psychic vampire myself? The emotion they always pick up on is when I'm upset, which they feel in their solar plexus. I'm aware that it's actually their need to be connected with me that's stopping them cutting the connection, but how do I help." The question is are you being upset with them when they feel it? If so, then its likely that in truth you may still be holding some form of energetic connection - some kind of mutual need. Please don't be offended by this, it happens to us all! It just takes profound self honesty in dealing with it. When you're sure you have no neediness of them, then you may cut the tie energetically but it is unlikely to be released until you're sure there is no neediness on your part. So assuming we're not projecting at the person we've just cut the tie with, how best can we help them? Well causing them to be authentic is the very best help we can give and we've already made the first step by proverbially "kicking away their disempowering emotional crutch". It may sound harsh, but the kindest thing we can do to another is cause them to confront reality the way it really is and that means becoming complete and whole. Of course it can be done as gently and compassionately as possible - so for example making them aware of what you're doing and why. You might also feel to give them something energetically - as I did a rose in the example with my mum. Sometimes you may still feel their negativity and this may cause negative or emotional thoughts to arise in you about them. If you are both psychically sensitive then yes they will feel it and most likely in the solar plexus. So what can you do about it? If you suspect that you've projected negative energy at someone (and it can happen quite easily), one thing you might try is this... with your intention visualise and feel all the negative energy being drawn back towards you and gathering in a dense ball in your hand. Then either throw or kick the ball into space (!) and watch is exploding into light in the heavens. Give it a try, its worked wonderfully for me in the past! "3. How do I carry on my lucid dreaming without taking extra travellers on board. I'm asking this question in this thread as I feel it's connected. My dreamworld is my other reality, I get alot of spiritual work done while I'm asleep but quite often either the dream is taken over by some1 else or I have tag-alongs. I've actually asked some1 before why they were using me and they said "sorry love, I have unfinished business and need you to get it done". Problem is I wake up exhausted and feeling like I've run a marathon. If I close myself off before I fall asleep I don't get the work done that I need to do. I'd like to ask you here, are you actually aware of what you're doing whilst you're asleep? How is it determined what work you're doing? "4. Any ideas on how to hand back some1's issues without them noticing and putting up at fight? Since the retreat I've been aware of which issues are my own blocks and which 1s aren't. Am currently handing ppl's issues back to them and while they aren't aware of what I'm doing they are aware that they're not getting the same relief and they're not happy bunnies. This is kind of connected to Qu1 I think. Yes it is completely related to question 1. I would add that if someone really was projecting at me, I believe I would want to let them know what I was experiencing as a result of their stuff - I'd want to "call them on it" even if gently. So if the person kept confronting me with it, I would make them fully aware of what they're doing. If they don't listen and keep doing it, then when their energy interacts with you, at this point it will help to become completely "as nothing in it". To give you an example of this, I was once called to break off a long standing relationship and the person involved continued to project negative energy at me. It was extremely powerful. What helped me was imagining the energy coming in as bullets (because that's how it felt) but then I imagined the bullets passing straight through me and all the while remained calm. Eventually the person tires of what they're doing and ultimately, because you've taken the target away, may well be caused to realise their own judgmental behaviour and actually might then have the impetus to do something about it. At the end of the day, if we are being profoundly honest with ourselves about our motivations, then that's all we really have responsibility for. I've worked on what you said about the fear of attack being the opening for them and it's so true. To become nothing is definately working. A total acceptance of the situation, and of the emotion being handed over is the key for me. The phrase "fear feeds fear" is never truer. I'm finding this way works for every part of life that could potentially cause negative emotions, to accept the emotion, be as 1 with it, does set it free without any residue. There are many good ways of protection, the crystal grid is fab, but all these are made much stronger if worked alongside acceptance. My dream world is way too complicated to explain on here. It'll have to wait to when I next see you guys. Not "rising to the bait"
"I have always practised the traditional psychic protection of surrounding myself with a shield or bubble of light and found it to be very effective. I have been meditating more lately, but have also neglected my usual protection and wonder if I am under attack with headaches and racing thoughts. I live and work in London and surrounding myself with a bubble is my Ã¢â‚¬ËœlazyÃ¢â‚¬â„¢ way of protecting myself. However I have started to wonder whether it was the right approach to the problem of psychic attack, in that yes it is fear-based but it also affirms myself as being separate to the whole and creates a boundary between. Your approach of becoming nothing to it makes sense, but also feels a little advanced for me and IÃ¢â‚¬â„¢m not sure IÃ¢â‚¬â„¢m sensitive enough to locate where the attack is, why itÃ¢â‚¬â„¢s happening and then to feel confident that itÃ¢â‚¬â„¢s been removed. I will definitely give it a go however, and any more tips you could give would be very helpful." I would say psychic attack in London is inevitable and rife due to the denseness of the energy there. So firstly how do you know if it is happening? The key is to continually (or as much as possible) be in a place of the observer of yourself and watch the times when you loose inner peace. It could be for example that someone in authority over you - like your boss - "attacks" you with judgmentalism negativity or control. Or it could be someone being rude on the tube or in a shop which pushes your inner buttons making you stressed and tight inside. It might even be a friend a relative or a partner who had a hard day at work. These would all be instances of possible psychic attack - the instigator is possibly having their internal buttons intentionally activated. Becoming nothing in this involves always having "an eye" on our internal state of consciousness - what we are feeling. If we feel ourselves "rising to the bait", we have a choice: either continue to be manipulated by this energy or relax into it and not rise to it - become awesomely okay in it. I've found it may help to do visualisations - in some instances for example at the beginning if the attack was very powerful from someone, I'd see the incoming energy as bullets but then watch them pass straight through me. Its also important however to afterwards process what happened and ask why did you "rise to the bait" in the first place? It tends to signify an attachment to an outcome - where we wanted or felt we needed a particular outcome. In so doing we may release attachment and then the distorted neural pathway in the brain (the button) will dissolve so that we are less and less effected. I understand your way of thinking - assuming of course you're trying to make a serious point beyond the humour! So it seems you've made the realisation that our reality is shaped and distorted by the state of our inner consciousness right? It also seems like you've made the next leap that so many seem to do - "if I shape reality by my state of consciousness why not change my state of consciousness to create a new reality?" Or alternatively, if there's something I don't like why not simply process it out? Unfortunately, (or fortunately which ever way you look at it) this is a flawed understanding of reality. That part of you which makes a statement like "I intend to create a reality like this" is that part which is still separate from the "all that is". It is that part which still considers itself to be an identity. In other words an ego desiring or choosing and is not willing to accept things the way they are. That identity is what can be termed the "shadow" or "imposter" of the "seer" - the seer being absolute non-identified awareness. In enlightenment there is no need for intention or even choice - who is here to make the choice? There is simply awareness and an arising from that awareness of authentic purpose - what you might call "soul". The soul is our unique expression of the absolute and arises without intention, desire or effort. It is only the ego that then wishes to own what does or does not arise. It is of course possible to distort our reality with intention - or rather I should say, YOU can distort YOUR own reality with you own intention. However the illusion that you create will not persist indefinitely - why not? Because we are all interconnected and every single thought word deed effects every other part. You might be able to override in your mind what is really going on but what you won't be able to do is override the consciousness of EVERY CELL OF YOUR BEING (billions of them of course ) which are interconnected to every cell in the universe. If you could do that, then you would change the reality of every other being in the universe - and here's the divine paradox - you'd have to be enlightened to do that and in enlightnement there is no need of a choice - there is simply flowing as one with the universe. I also have to say this view of manifesting false realities seems to me to be without real compassion of where other people are at and the reality they are experiencing. Try telling the monks in Burma currently being brutalised by the military dictatorship "all you really need do is choose not to be attacked". Would you suggest they try psychic galic too? Yes indeed it seems like you've had a tough experience. Fortunately you seem to have taken a very positive attitude to it. In so doing, the incident is only likely to make you stronger and more positive. Well done! I've sometimes heard of spiritual workers sending negative energy back from where it came. It seems that its worked in your case. However I know its not something I would do myself. Where I've previously felt negative energy attaching to me in the way you describe, I've tended to first 'become nothing in it all' (as I described in the intro article at the top) and then filled myself with light and heat - that way, anything of a lower vibration tends to just melt away. Sometimes I have felt that light and heat flow out of me to the source of the darkness - ideally to heal it. I spent many years studying and practicing the martial arts. We used to have a saying "every attack is a cry for help". If someone attacks us its because something is hurting inside of them. That's why I think forgiveness is perhaps the most important thing in our spiritual journey. It makes us more open inside so that more light can flow in. The objective of Opposing Consciousness is to make us tight, fearful and negative - why let them win? Once upon no time there was a Little Soul who said to God, "I know who I am!" God smiled a big smile, "That's right!" God exclaimed. "You are the Light." The Little Soul was so happy, for it had figured out what all the souls in the Kingdom were there to figure out. "Wow," said the Little Soul, "this is really cool!" But soon, knowing who it was was not enough. The Little Soul felt stirrings inside, and now wanted to be who it was. And so the Little Soul went back to God (which is not a bad idea for all souls who want to be Who They Really Are) and said, "Hi, God! Now that I know Who I Am, is it okay for me to be it?" And God said, "You mean you want to be Who You Already Are? "Well," replied the Little Soul, "it's one thing to know Who I Am, and another thing altogether to actually be it. I want to feel what it's like to be the Light!" "Well," said God with a chuckle, "I suppose I should have known. You always were the adventuresome one." Then God's expression changed. "There's only one thing..."
"Huh?" said the Little Soul, who was not a little confused. "Think of it this way," said God. "You are like a candle in the Sun. Oh, you're there all right. Along with a million, ka-gillion other candles who make up the Sun. And the sun would not be the Sun without you. Nay, it would be a sun without one of its candles...and that would not be the Sun at all; for it would not shine as brightly. Yet, how to know yourself as the Light when you are amidst the Light--that is the question." Then God explained that, in order to experience anything at all, the exact opposite of it will appear. "It is a great gift," God said, "because without it, you could not know what anything is like. You could not know Warm without Cold, Up without Down, Fast without Slow. You could not know Left without Right, Here without There, Now without Then." "Yes?" the Little Soul interrupted, "yes...?" You're not the only one - fear not! There are huge movements of energy right now. Remember everything on the outside is a reflection of what's inside - I'm referring now to the 'big picture'. So the onset of the economic recession signals a significant process commencing in our collective human story. Much energy is moving - its kind of like we're dealing with collective karma. Its sending a lot of people into worry and fear - its probably this that you're feeling. I believe the Opposition is in a great deal of fear too. It signals a huge warning bell for them. Economic recession is limiting their objectives too. I sense there is a great deal of projection our way. The key is to be strong. We have to keep doing those things that connect us. Trust in the Divine and that there is a deeper purpose for all this. Trust in yourself - that you're in exactly the place you need to be right now. Nothing that was ever worth having ever came easy! Take heart. Work at your connection. As confucius said "If there's no wind, row!" It's absolutely fantastic that you've had these experiences David - even as unpleasant as they may seem. Now when someone else comes to you experiencing similar, you'll be able to speak from direct knowing. There is nothing more valuable than that, and those who you will help, will resonate and feel the truth in what you say. There is only ever one way out - that is through! I posted this in an old thread to avoid double-topics. I now noticed you seemed to have changed your approach quite a bit since opening this thread - above you talk about Archangel Michael wich is not your current vocabulary anymore. My question is: What happens if someone opens his field with the intent of opening to Archangel Michael? Is it the internal configuration (e.g. needy) that determines what he will bring in? His imagination? Clearly we all go through different stages of evolution. I still 'call' on four Archangels: Gabriel, Michael, Raphael and Uriel. However, what's actually going on for me, is that these are really symbolic of something that is already welling up from inside of me. So as I feel that energy building, or when I'm drawn to a resonating synchronicity, these metaphors help me invoke more of that energy from inside myself. I do believe in these beings as separate entities. However, for them to truly work, I sense they're working through the spirit-light-body at a high dimension of connection. So they help cause a resonance inside of ourselves. The only way to really understand and get to know this is through experience. Sometimes energies will come in, appear to be 'friendly', then increasingly take control of our field - many people willingly give up their autonomy because it may initially appear benevolent. This is (from my perspective) mostly what goes on during 'channeling'. We mentioned the film "The Adjustment Bureau" - the metaphor gets it pretty well. So in my experience, it can greatly help to open to higher dimensional influences. But we need to become very discerning as to what those influences are. It's actually fairly straightforwards PROVIDING we're truly being honest about our motivations. Glamour often gets in the way, or neediness. And if you find yourself being spoon-fed (like so many of the channelings), I'd be exceptionally careful of 'who' is holding the spoon! I was wondering.. is it possible that there is 'someone'/'something' following you through some of your incarnations? And how can i deal with it? i feel for a long time that this is happening but i didnt have any 'evidence' to be sure. only something that happened recently. it seems 'he' is influencing me so much. By the Law of Attraction you draw to you that which you need to process out your own identification with the physical. So what is it that you're afraid of? i am afraid that everything i fear i will cause them to happen. i first felt 'his' presence (i say his cause i have an image in my mind) before i knew about opposing consciousness.and i remember i felt that 'he' has been following me for a while. And i thought it was crazy and these things dont happen. but they do. so what if the things i am afraid they can happen, its possible to happen too? one reason i draw it is because it made me feel helpless and passive. i was under his influence and i couldnt do anything about it because he was the strong one and i was the victim (i still feel that but not as i used to). until i faced it and i realised 'he' is afraid too. the more i wasnt afraid the more he was showing off his power. and it was ok. i felt strong although i was in pain. i still feel fear but now i am not gonna run. one thing i dont know how to deal with is the fear of not being in control of my self. i have this picture in my head that if i let go and open my heart 'something' may come in. and i wont have the control (literally). this may not even be possible and it may just be in my mind. but it feels i have felt it before, i cant exactly explain because i havent but its like i know how it feels. same way i knew about that presence. so unless someone can assure me that this wont happen, i cant get into it. this is different from getting into the pain. i cant risk to get into that fear because even though i know now that they are powerless if you are not afraid, i still have that fear. and i may cause it to become real. there are other reasons too but i think i know how to work with them, except the one i described above. This is exactly how Opposing Consciousness controls people sub consciously. Some people fear opening up because of letting 'something' in. Yet that something is already in. And it's the opening up that ultimately will get rid of it. It creates in people the fear to open up, because of the pain, discomfort and challenge they then have to confront. You see it's all a game of inner alchemy. Everything is consciousness. If 'they' can scare you back into the illusion, back into the sense of separation then they have won. You're performing how they want you to perform. They have no control when a person challenges this conditioning. When we're prepared to go into it and soften (I've said this to you many times Vaso - when are you going to begin?). So it's about sensing the fear and pain but instead of retracting with the mind, going deep into the feeling of it and surrendering into it, so that it doesn't hold you any longer. Once the field breaks down within you, Opposing Consciousness has no hold on you. im not afraid to get into the fear of pain. it is the fear of not being in control if 'something' comes in. but it is time to get into it. i have come close some times and i back off instead of surrendering because im afraid. Thanks for referring me to that article. i will read it again. This is a link to an excellent article on the topic. The information provided here is pure gold. Just reading this article after a search on psychic attack. The last couple days I have been feeling intensely insecure and been working to accept who I am - working to let go of needing to be something different than I am and opening to the sense of, the feeling of me - who I am authentically and how I truly feel to express. However, at the same time I have been unable to sleep, waking suddenly out of dreams feeling filled with anxiety, nauseau, headache....just laying there feeling it and knowing that acceptance is the only path through it - to not fight against it or try to change it. This morning as soon as I woke up I felt intense feeling of being literally under attack. This feeling has been going on a while but more subtly - been feeling myself as being attacked by others - and feeling intense feelings of adrenaline over very small things. Although I am working with it, there is still a sense of wanting to be different than I am - not full acceptance. I feel frustrated by what I see in myself as social awkwardness, and often times no urge at all to say a thing but an intense pressure to have something to say. From reading this article, it sounds like, this lack of acceptance is creating the opening for what definitely feels like attack because I am attacking myself. Oh man, this is a hard one...I will just have to keep working with that judgement within and finding a way to be ok with how I feel to be just as I am. Hi Jenny, that pressure to say something that you are experiencing seems like your ego creating anxiety about the future, (I want to be somebody, so I must say something). Simply 'being' in the moment without the need to comment on it is more difficult to achieve but is certainly the more authentic experience. Ekhart Tolle's books on the Power of Now and A New Earth can explain it far more eloquently than I. One exercise that I found really helpful was to question the motive behind every thought (a big task) from the position that there are no neutral thoughts! Thoughts are either positive - from a place of love - or negative - from a place of fear. In this way I very quickly came to realise that we have far more fear based thoughts. I was then able to 'go into' each fear and let go of it. As Open has written in many ways, the Ego will fight extremely hard when it's existence is threatened. Anyone on the path will be threatening their ego constantly until it is finally integrated. Thank you for your input. I am aware of the root of the feeling and the thoughts...I feel quite settled into the place of observing. I find I can be set deeply within and still feel a sense of who I am behind all the comings and goings of the thoughts, feelings, emotions, though fear quickly pulls me out. For me, at this point, when fear arises this is a key time for me to really root into the feeling in the body as I quickly respond by going MIA internally...this is somthing I am working with all the time. After some reflection, It feels to me like I am holding the space for this feeling inside - and as the moments arise - containing the feeling that comes with the thoughts of inadequacy etc....and rather than acting out the same way I normally would (with typical social banter or what have you) - giving enough room for that to burn out. I got a bit of a flash of insight after writing my post and there was a knowing that there IS a truth in the inadequacy of what I am saying when I am feeling pressured to say something because the moment is actually inviting me to be still enough inside, open enough inside in that moment to allow the words to come - the ones that are divinely given...and often that may be silence. It's not easy to allow that to come...but that's where I feel I am sitting now...between the old pattern and an authentic expression. Yes Jen, I'd say that's more accurate. The thoughts are lower density than the feelings. Thus the thoughts must arise as a product of the feelings. This is a common mistake in the spiritual mainstream. They see thoughts shape reality, so then try to manipulate the thought. But the thought is only the effect and not the cause - it's the karmic effect of something much deeper. Thought is only a 3D expression, influenced by the karma we hold in the 4D. I witness this often in spirituality. There's a kind of 'fake it till you make it' approach. But all it does is cement a controlling element on top of the source consciousness - the feelings. And whether people know it or not, these repressed and distorted feelings are still creating reality. So the thought must be a sign post into the feeling. We trace it into the feeling, get deep into it, allow the density to unravel, then the thoughts will change naturally and come into alignment. People in the community are sharing that there's a good deal of Psychic Energy Depletion (psychic attack) going on in the field right now. My strong sense is that it's coming from (what Openhand calls) the 'raptor consciousness'. It is that denser vibration, a controlling energy that's like a consumptive virus. It's prevalent across the planet, has been so for millions of years, and acts through humanity's denser vehicles of expression. I've described it's origins in the Divinicus Book. Right now, that energy has been deeply stirred up and it's stronghold here greatly challenged by the supportive realigning energies of benevolence. Various energetic layers of the matrix have been stripped away in recent years leaving that denser energy feeling very exposed - that's my sense of it. That energy is bound to react and fight back, it's what happens when you stir the 'bed of the stream'. So the first advice to give is to say not to worry if you feel this denser energy depleting you, either during the day or in your sleep. It's going to happen as this energy is confronted, unraveled and stripped away from the planet over time. But you're strongly advised to counter it in your own field too. Build sense of Warrior Will: The more presence and attention you can bring to your field, the more likely you'll feel the subtle signs of intervention. So then begin to work against it, using your intuition and sense of will. Recognise this energy does not belong in your field and doesn't serve you. Let this stir your ray 1 warrior energy. Without anger, judgment or resentment, begin to push out this energy from your field. You can use particular meditations that you're drawn to. Deep consciousness bodywork for example like soulmotion or Tai Chi (with the sense of the warrior) or strong, energetic dance. The importance of staying grounded: Make sure in all these counter activities that you stay grounded, that your energy doesn't leave the body or rise only into the higher chakras. So make sure you root yourself to the earth; push your energy down through your body into your legs and through your feet. The raptor consciousness is dense, you might feel it coming up from the ground, hence the need to push back down, to root the fullness of your consciousness throughout your body. Establish energy fields: Consider establishing energy fields through your home and general area you live in. These are established by what you might call an 'act of prayer'. It's not praying though and not asking for anything in particular. It's using your sense of presence and divine connection to establish a clear energy through the space that you live. If you or others are getting tight, wound up or angry in that space, use meditation to unravel it by sending peaceful waves through it. Switch off and unplug as much electronics as possible. Switch from wifi to ethernet where practicable. Switch off the mobile phone when not in use. Use the TV sparingly. All of these vibrations have a disruptional affect on your surrounding field and can allow in the intervention. Call in Support: Benevolence is there to help us in all its myriad forms. If you have the sense of a particular Archangel for example (Michael perhaps) you can call in supportive help and protection. Bear in mind that true benevolence wishes to empower you personally. So make sure you've actively engaged in your own self-realisation first through the steps taken above. But then by all means work with fourth dimensional and angelic support. You simply have to open your heart and invite that presence to work with you, being very clear, that anything which doesn't support your highest good has no invitation into your field. You can actually state and feel the energy of this through your field as an act of meditation. Finally, it's important to evolve your behaviours over time. Especially now where the raptor consciousness will be working to influence those behaviours. Here's an important video on dealing with this energy that we call "Healing the Divine Warrior". It offers plenty of important insight into this distorted energy and how to negate it within you. Sending you love and support in these challenging times. Have no fear, take heart! Your article is so timely, Open. I feel like I was in an episode of Star Wars of late, facing down Darth Vader and the dark side, aka negative entities. I got lost in an illusion within the grand illusion of the matrix for a bit, engulfed in fear and panic. But I continued to call on the support of the angelic realms as I drew down the energy of higher consciousness through my bodymind and persisted doing Openhand meditations, including Trinity's releasing negative entities meditation. One day I broke through to the other side, and the scary illusion dissolved like a bubble bursting. And yes, I gradually became aware of what the Intervention was teaching me. It's a good thing I had spunky warrior, Luke Skywalker, by my side along with many angels. I was and continue to be inspired by the words of Sir Winston Churchill, "When you're going through hell, keep going." I'm ever on the alert, tuning into my energy field and the surrounding energy field. Your suggestions on how to deal with a psychic attack are much welcomed. Fantastic re-edition of the video guys ! loved it . I have watched it in a very deeper way as i confront the " Raptor consciousness " with more of the Ray 1 than ever before on a daily basis . As i am re-reading Divinicus , it truly connects to the " Berlin museum " chapter in the book . Understanding with more subtle Attention how it operates around us and within us and how to unravel it . 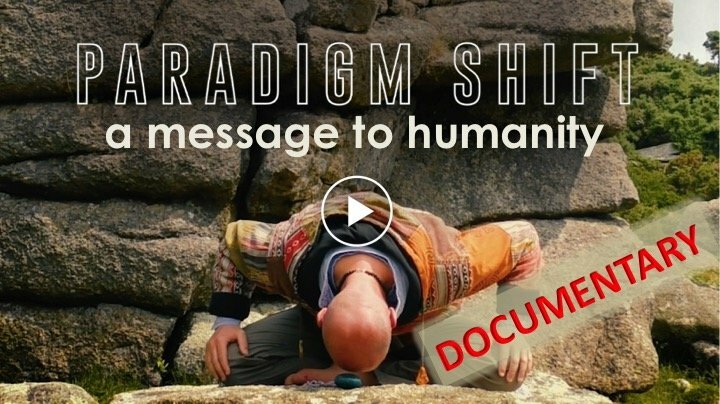 A great example i could experience last year presented itself as an Epic confirmation of how that energy works in some of the mainstream spiritual circles out there . 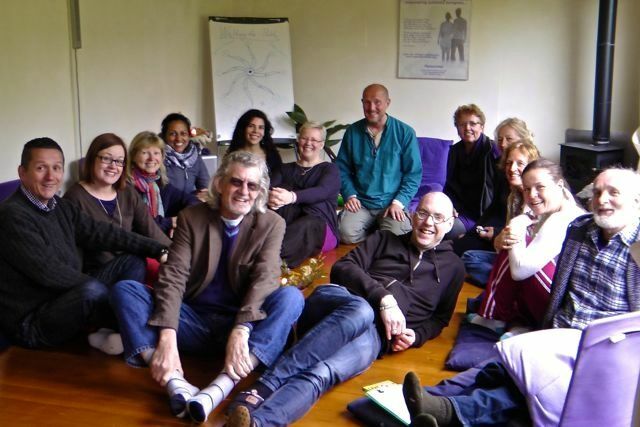 After the " Divinicus " workshop back in September , i surely felt a serious click/ opening inside on levels i could not truly measure or evaluate precisely yet . It surely ignited a clearer " awareness " within the 4th density field and it's subtle manipulations . One by one , those deception tricks would show up within my behavior or from feedback loops or from what i would observe happening in the matrix . Unity consciousness would also provide a big numbers of " Lightful " signs of synchronicity to keep attention to what is offered to learn / see / feel & unravel - inspiring sheer willingness to learn from each situation . Incredibly , the field becomes more visible with new dimentional eyes and refined intuition . 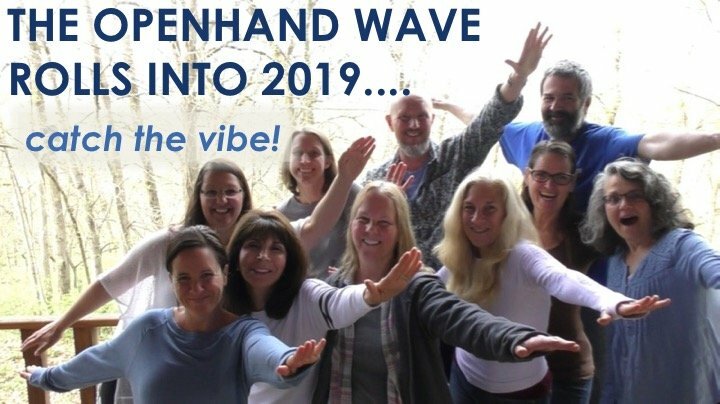 End of October , i suddenly felt it was time to see and confront the magnitude of OC within a spiritual circle i had connected to for years - through it , i learned a great deal about myself and traditional spiritual circles functionning . At times , i seriously would feel like Being a " ghost in the machine " for reasons i couldn't yet understand / engaged but only to a certain extend . I was now feeling ready to see a bit deeper within it's subtle layers of functioning . Ray 1 was strong / straight / sharply prepared + The diplomat to be smooth within any interactions but not weak . I was on a mission to unravel , confront softly and shine through with pure compassion / understanding . One by one, the veils dropped like cards and the more they were falling down , the more i felt empowered through deeper understanding . Amazing ! Divine ! No blame was to be felt internally - no judgment - just pure deeper understanding of why i relied on this soft shoulder to learn & grow - but only that far . In the same time , the Inner warrior was scanning the whole field to detect any signs of OC deceiving tricks ... and suddenly the first sign presented itself through music / loud volume in the dining area that didn't sound quite harmonious at all . With my high earing sensitivity perception , it didn't feel right at all . this was the first serious sign of OC presence i was now able to completely sense and it didn't seem that most people present were annoyed at all - how weird !?! Am i the only one to deeply sense something is wrong in the field here ? Wow , that's even more amusing somehow . They put high volume sacred chants in the dining room and nobody really feels how distorted this sounds . I was about to discover more subtle eddy currents within the next 2 hours - I was absolutely astounded by this refreshed ability to shine forth a new light on the whole hidden phenomenon . incredibly enough , i was able to keep full inner composure and enjoyed the mission so much that i left feeling completely releived . I just cleansed a blind spot / attachment . lately , on the Sunday of Easter , the flow brought me a bit deeper - within family old patterns . I truly felt a beautiful beaming light shining from the heart & leading every movement / action / word / behavior as if there was a new vehicle of expression . It was as if , the inner work done for years is finally showing a new vehicle of true expression of Who I truly AM . In this sense , judgment / blame / past stories / criticism never showed up during the 4 hours of the gathering . The sun was shining outside so brighly it surely helped every exchange i was invited to to be lived so smoothly - with compassion / attention / understanding / wider acceptance / with JOY !!! True miracles happen when we let the real " Divinicus " shine through the distorted field that has created su much pain / misunderstandings within families . I truly felt miraculous to Be that " Bridge " that can heal anything & challenges any distortion ( progressively of course ) . I also felt resurrected from years of family turmoil & misunderstandings . Probably the best part is that the heart knows no ownership for those miracles when they happen : It feels right and it's offered for true liberation of the " raptor consciousness " within myself and others . These examples of alchemic transformations are incredibly empowering and encouraging for all of Us . New bridges in the field are created - isles of transitions that create the new sense of higher co-creation . Yesterday I was free wheeling in nature. I was following the pull and getting several signs that I needed to take ownership of my space and that there was something unwanted there. Prior to this I had been noticing several lizards. 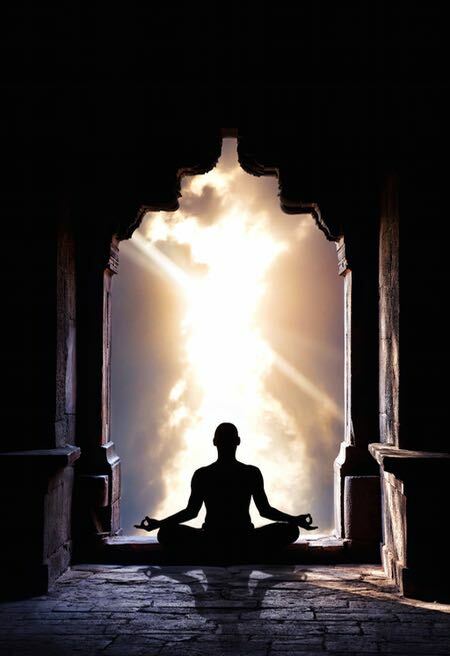 As I sat in stillness I was able to find and work with something within my solar plexus. I am wondering if when I am surrendering and following the pull of the soul do I trust that the pull is coming from higher guidance or could something be influencing me when I am letting go in this way. Do I need to discern where the guidance is coming from within me? I haven't put a lot of attention on this but it sometimes feels as though it comes from the heart, other times the solar plexus area and even other times things drop in through the mind. As I continued walking I saw some kind of poisonous snake crossing the path right next to me which I startled and it took an attack position towards me. Later that day I saw an alligator walking next to the road. Today I am seeing lots of 3's. Wondering if this means I need to not follow guidance coming from my solar plexus and just keep trying to discern where the guidance is coming from. It's a really great question and an important exploration. Guidance can indeed be deceptive and we must be clear where it is coming from. Consider it this way: there's a higher flow coming from the source, and a lower one through the matrix. The intervention has thus far disconnected from the higher flow and built a system of control, influenced through the 3D/4D field. So there is this powerful manifesting guidance in this lower field, but it is only self serving and will ultimately lead to catastrophe and breakdown - because no system can ultimately withstand the realigning might of the universe itself. So this is the old reality - which although at the moment seems persistent still - is beginning to fracture and will ultimately break apart. The solar plexus is where we integrate the higher flow into the lower one. So when people feel an intervention, they often feel tightness in the solar plexus (and nausea). And yes, many people are currently following this distorted lower guidance - that's what the whole 'intentional manifestation' movement is inadvertently tuning into. It is being controlled by the intervention so as to prevent people reconnecting to the higher flow of life. So it's brilliant that you're actually now consciously experiencing these two flows and authentically manifesting situations that reveal what's going on inside. That's what happens when we unfold into new layers of previously dormant or suppressed consciousness within. Work to listen and intuit the higher flow first. If we open deeper into awareness and stop trying to control day to day life, then we'll start to open a channel into higher knowing. It simply lands in our consciousness as visions or a direct knowing to do something. Then let this come into the heart to begin to direct you through the field. 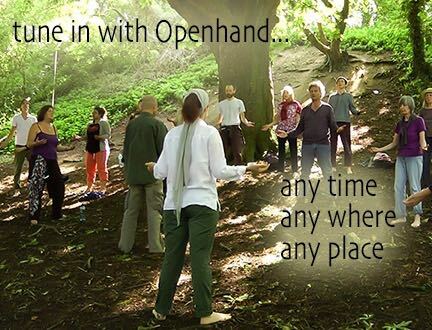 This is exactly the 'free wheeling' work we do on the Openhand level 2 course Path between Worlds. But the flow must also come into the lower densities - through mind, emotional and physical body - or else we couldn't do anything with it! This is where we must watch vigilantly where some kind of conditioning, latent desire or fear based sense of lack wants to do something with that flow and use it to placate a conditioned behaviour - one that needs some kind of outcome. This is where the intervention takes over within us. Let the flow take you towards a creative act, but watch the tightness within that might try and own that. Watch for blindspots - where you might go unconscious an act out previous programs. You have to catch these blindpsots and break them by changing behaviour patterns. When I was working intensively with this, the flow took me to many potential creations that I believed would manifest, only for them to breakdown right at the last moment. I had to deal with a lot of doubt and frustration. But with persistence you break through it. Remember what this is really all about: it's not about creating things, but unleashing beingness. Then allowing authentic creation to simply manifest from beingness. My drive to be authentic is, I think, overwhelming my ability to truly be authentic. Last year I felt a shift from the lower chakras (the lower triangle) into the higher chakras. The shift was subtle but obvious once I recognised what had happened. Since then I feel an obvious force pulling back into the lower densities and into old conditioning. I've done this before, but intellectually only. And at that time chose the Matrix. Now, having understood that there really is only one choice, I appreciate the reality of manifesting in my life. Just yesterday whilst sat, meditatively contemplating the rising sun, I heard a bird stir in a tree nearby. The sudden thought that occurred from my phantom self was "I hope that bird doesn't fly past and poop on me" It immediately left the tree to loudly deposit it's bowels about a metre away. I laughed, recognising what I had done and then 'I' thought, "and now another bird will fly very lowly and directly over my head towards the glorious Sun". And yes, of course another bird did, just that. I was filled with love, light and awe for much of the day. "Work to listen and intuit the higher flow first. If we open deeper into awareness and stop trying to control day to day life, then we'll start to open a channel into higher knowing. It simply lands in our consciousness as visions or a direct knowing to do something. Then let this come into the heart to begin to direct you through the field…. But the flow must also come into the lower densities - through mind, emotional and physical body - or else we couldn't do anything with it!" Perfect synchronicity. I'm completing a three-part healing workshop with my Chiropractor/Shaman, called "Body, Mind, Spirit." Garth uses a highly skilled method of muscle testing that bypasses ego (no attachment to outcomes) to guide my soul energy as it flows through my mind, emotional, and physical bodies to identify and feel suppressed consciousness -- and then upwards to the heart where I feel and process the release of conditioned habit patterns thereby creating a new way of being. We elevate to higher consciousness at the beginning of the process, so I experience the energy flow as circular drawing higher consciousness down from the heart through the lower densities and back upwards to the heart. I'm becoming more and more aware of the "ins and outs" of negative entities when they latch onto my suppressed consciousness as the mirror tells its tale. The Galactic Core sure does come in handy at times as an exit strategy. The releases always land with a whiter shade of pale. I observe that the mirror is gradually changing to reflect the release of stuck energy. Thank you for your sharing too. Yes, at this stage for me, finding authentic beingness can be quite challenging also. I just wanted to clarify something about what you said in your sharing. You said " I appreciate the reality of manifesting in my life" and from the examples you shared I am wondering if you are referring to intentionally manifesting. In my understanding of the Openhand work that is not authentic beingness. " It is about allowing Right Action to unfold as a natural expression of who we truly are", not changing the outer world with our thoughts and intentions. Also when you say you left your tightness behind by shifting into the upper triangle how were you able to do this? In my knowing we have to confront the tightness in order to move through it. This community really helps me as well and I can appreciate the mirrors others provide here. Thanks again! HI Kim, thanks for your questions and I agree about the video, so much resonates. In terms of manifesting I have intentionally manifested things into my life, more through interest than any real requirement. However, I recall something Yogananda wrote about being sidetracked from the path by Siddhis. I think the belief that you can Control what you manifest to be ultimately erroneous. To elaborate on my example... as my mind caught the edge of a fear based thought about the bird pooing on me I laughed immediately at the conditioning and the response from the Universe. My next thought was equally as spontaneous but, felt more authentic - I feel as if it was less about Me manifesting a bird to fly over head and more about me tapping into the flow and intuiting what was happening in that moment. Does this help? On your second point I have practised various yoga Kriyas on and off for a few years now (about 20 lol) but about 3 years ago began practising Sodarshan Chakra Kriya. This Kriya acts directly on past Karma and as I became more adept I had to deal with the emotional turmoil that it resurrected. I am not a visual person; however, I am very kinaesthetic, so I struggled deeply with negative energy and emotion, to the extent that I do not habitually practice this anymore. Thanks for your response. I do believe you can control what you manifest and I find many people are focusing on that and I see many workshops here teaching that so I just felt to ask you about it. Openhand has cleared up many distortions for me including this one. I am not familiar with that particular yoga Kriya but it sounds interesting and I'm glad it has worked for you. Thanks for taking the time to explain. Just fell upon this article and I value so much your sharings and experiences Open, Thank-you so much :). I had a psychic attack yesterday that I was aware of for the first time. My youngest daughter has been coming home from school for the last couple of days and throwing really intense tantrums about the littlest things. Later I was asking her what has been going on, what she is noticing when this happens, and I told her next time to see if she could remember to feel in her body. Not long afterwards I was feeling nauseous and later got this really bad headache. It persisted and I remembered I had seen this article again recently. I was not able to read it until after swim lessons, soccer tryouts, dinner and bedtime so by this time I had been feeling it for over 4 hours! Finally, when the kids went to bed I reread the article and had time to work with several things that you shared. I felt so much going on that I was able to work with and process that I am grateful for the experience. When reading about cutting the energetic ties I was resistant. I felt it was connected to my daughter and the part where you said "my mother's consciousness might suffer from the removal of the bridge," the energy work I have done that says you naturally have this connection with your kids and an idea that maybe I somehow could help process it and it would help her too (I would choose to suffer rather than her) kept me from doing this part. After sitting with this today I see this is all just my own fear and attachment. I am wondering though wouldn't the cord just reattach between us rather quickly anyway or do both parties have to need something from it? Is it EVER helpful or ok to have an energetic connection to you kids or anyone else? It's a great question and one of those immensely challenging situations. And what it does most of all, is kind of 'call your bluff' about who you really think you are. Are you being an expression of the One beyond all attachment? How is your soul being bought right now? Let me put it like this: you hold out a hand to someone who is sinking, yet you're not standing on firm ground yourself. What's more, because they trust you and have taken your hand, you give them the erroneous belief that they're now safe. You have to be the solid rock - whole and complete, within yourself. You can't save anyone if you're not solid yourself. If your soul can be bought, then it can bleed energy. I know this may sound really harsh, cold even, but I assure you it is not. If I am solid as a rock, in any given situation, even as my loved ones are being challenged or in some kind of peril, only then am I really able to help. If you have this fixed energetic bond, then it becomes a co-dependency. And if the other goes down energetically, then it takes you down with it. But being the solid rock doesn't make us cold - not at all. It provides the capacity to keep holding the energy, no matter what is going on. In which case, you're encouraging the other to see the light in you and find it in themselves. And it's not about how intellectually old the other person is. Who knows, perhaps your daughter - as a soul - is even older than you! Cutting the fixed bond doesn't mean you cut the compassion. Not at all. It means your soul is not governed by the actions of another. It means you're actually able to give more, not less. But yes, I'm not saying it's easy. Mastery never is! Open your words do not sound cold or harsh, just true. I am guessing these bonds will be there or just keep coming back until we are free from all attachment. Trinity, thanks for the support. There is so much to let go of and yes it can be extra challenging because of this bond. I found this very helpful, "Often the best thing I can do is hold the space so that he feels safe to feel and explore what he is feeling - not to make it better, but to help him find his own way through it. It feels much stronger in the long run. " I do have this strong feeling like I need to help but have to keep remembering that I am really helping no one. Only self realization going on! For me it is this feeling of responsibility that I know is my Karma. This is bringing up a lot for me, so much sadness I can't stop crying. There is this pressure in my head. Yes holding the space for someone is helpful, leading by example is helpful, but I can't help feeling like I can't help anyone, I am the one sinking in the mud. If I just focus on self realizing myself it may be helpful to another someone but I do not want to feel like I am helping them. I'm wondering Kim - would it be possible to accept the strength and respect within yourself and not worry about whether others catch it or not? Just do it for you? You may or may not provide an inadvertent mirror for others, but if you can't find it within...well then...you have nothing to share with others and can't help them anyway. So.....delight in finding and nurturing Self? I feel like that is what I was expressing. That i am just uncovering my Self and if that is helping others, great. The "not worry about whether others catch it or not? " is probably the feeling of responsibility that I am working on letting go of. Maybe there's an internal confusing of what 'responsibility' means? So there's a responsibility to be you, and to express that out into the world, including other people - we did indeed draw each other to co-create experiences. But the edges can then get blurred as to whether we might feel responsible for their self realisation. One of the hardest challenges, is to engage energetically with another that you love, in the deepest of ways, yet still be able to draw your energy back inside yourself. We have to be able to really dance with another, in their issue (assuming it's invited), but still be expressing our own dance. Earlier Kim said that she felt guidance come in through the heart, the mind and the solar plexus. And she's having trouble deciphering what's coming from higher and what's coming from lower. Open answered and said "The solar plexus is where we integrate the higher flow into the lower one. So when people feel an intervention they often feel tightness in the solar plexus and nausea." In the end I still didn't understand which was coming from the higher guidance? Was it the heart? Or the mind? Or the solar plexus? Also I get confused, since we are creating our environment and it's a mirror of us. We are also suppose to be aware of syncronisitie's in our environment as confirmation we are moving in the right direction. Yet, I am the one creating all of this and most likely from my lower self? Soooo....How do I know I'm not just leading myself astray all the time? Which honestly is what it feels like. I hop back and forth between these two all day until honestly I'm just mentally exhausted. Directionless. What does one do for that? Yes it's a difficult conundrum - but there are some big clues that can make it easier. Firstly, there is no 'right direction' as you put it. It's an erroneous view in the spiritual mainstream that synchronicity points to some destined outcome in which 'all will be well' (or something of that kind). The flow is working to reveal beingness - destiny is unveiling the fullness of who you are and synchronicity lets you know when you're aligned with that energy. Yes we are all creating our reality: both the aligned part and the distorted part. We're creating mirrors by which to see ourselves; to unravel the distortions that expose themselves and unleash our gifts of beingness. The higher flow will land (generally) in a couple of ways: either direction landing as knowing, like a flash of inspiration - engage here now (in order to reveal you). Or it may be as a pull through the heart - the sense of a direction (but always the direction is leading in a way to invite you to express you). This higher flow descends into subconscious - lower - mind, through the solar plexus chakra. But on this journey down through the dimensions, the creative flash frequently gets sidetracked in most people: it gets distorted by their desires, attachments and fears. It's like putting a magnet next to a TV screen - all the pixels condense in the direction of the magnet. This creates the lower flow - the matrix - which is the expression of human karma working to resolve itself out. The solar plexus often gets tight when we're expressing a distortion like this (the sacrum too). It's a way to know when you're in a distortion and experiencing interference. You have to work into the tightness which usually revolves around the need for some kind of outcome, or else the resistance to what the flow is actually inviting. U always have me at a loss for words in how you can explain and express yourself and of course your beingness and enlightenment is.... I can find no word.... Your last sharing and that video are priceless and once again your guidance for me is immeasurable and a blessing. How do you combat phychic attack? I consider myself a "targeted individual" as I am being gang-stalked for a number of years now. Prior to the stalking, my life was very simple. I was unaware of all this type of spiritual activity, in fact, I didn't believe is could happen. I am a Christian so I do believe in the spiritual realm, however, I had no understanding of negative energy projection. I am constantly under attack in my home and outside the home. I know it's coming from an organized group. It seems I was put on their hit list. What I don't understand is how is it that I could have lived 50 years without being susceptible to these energies and one day I am. How could all these people most of whom I do not know have an attachment to be able to inflict me with their negative energy? I consulted a psychic and she told me there was a hole in my chakra which allows all sort of energies to enter my spiritual space. What can I do to close this opening that I cannot be affected by psychic attack? I may have something. The malevolant entities I've crossed differ quite a lot. Kinda like humans, from the schoolyard bully to the warlord. They got their own agendas and means of achieving them. Some lurk behind the shadows and are rarely noticed. They got their silver lining but, I drew them too me so they were all great teachers of something. A good approach is to accept them. Ghandi style. The less resistance the less they have to work with. Boost soul too its fearless. I've made friends with a few. They were alright. Made me laugh. They can change too. I'd say there's an important aspect missing from your analysis Paul - why did you attract the intervention in the first place? How were you being unconscious? Then instead of forming an intention to distance yourself from it, feel into it, feel the source of your unconsciousness. An attack only comes into this area and will keep coming in until you have made the dark visible.